From the sidebar menu, select Recordings. Click on the green Record Visitors button. Select the number of Recordings needed in a snapshot. The snapshot size will determine how many sessions Hotjar will track before it stops Recording. For more information, have a look at Snapshots for Recordings. 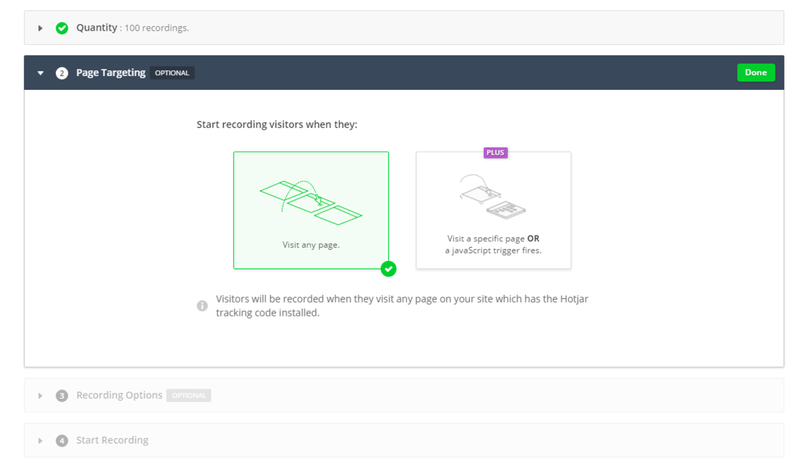 Choose when the Recordings will start capturing visitors. Turn on/off your Recording options. Only certain text fields are allowed to be whitelisted. You can see the list of fields that aren't able to whitelisted here. Are Recordings not being collected? You will need to wait a few minutes before you start to see data. If you know for a fact that you should have new Recordings but are not seeing any or are seeing incomplete Recordings, check our Troubleshooting article for more information on why this could be happening.